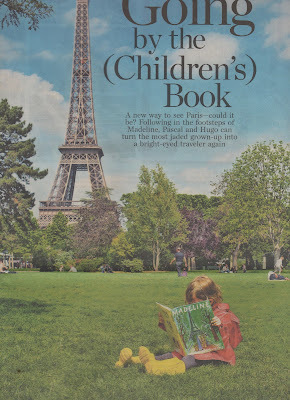 The Wall Street Journal has a fun travel feature about touring from a child's perspective. I find the article particularly interesting for two personal reasons. First, the author traveled with his four-year-old daughter. We went to France in 1981 when our first daughter was four and spent four days in Paris. She opened doors for us everywhere we went. A couple can be self contained, but not a couple with a child. Our little girl wandered up to people, asked questions, danced and repeatedly broke the ice. Second, the photo featuring the book Madeline. "Twelve little girls in two straight lines … the youngest one was Madeline." Showing a four-year old girl wearing a red rain slicker and yellow boots. That must be our granddaughter Madeline, who is now 8. Of course the author and daughter follow the 16-mile tour of Paris done by Madeline's group, across the Pont Neuf bridge over the Seine that Madeline fell off of, etc. The photo - Wall Street Journal. Click, but it's large.